I’m back with my monthly summaries, this one for May 2018, after not having my usual burst of energy lately. May 2018 has been a time of change for me, when important hospital treatment ceased and the road back to health began. Plus I got something else precious back – my creative spark! Tradition dictates that patients mark the end of their treatment by ringing a bell. 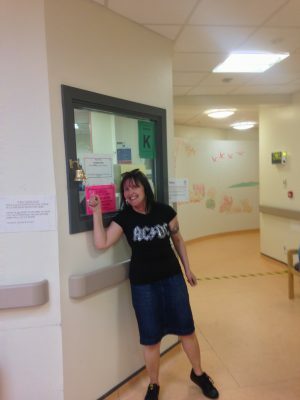 At my last radiotherapy treatment I wore my AC/DC t-shirt to mark the occasion. The nurses were even listening to Black Sabbath in the treatment room (a mere coincidence). And had a wee chuckle when they saw me tapping my foot along to Sweet Leaf! I’ll soon be posting about my adventure to the Hebridean island of Lewis and Harris where friends Martin and Babs live. They kindly invited me for a visit to recuperate and I’ve just returned. I loved every minute! In fact, that’s where I saw off my creative block. I was concerned about it while I was having radiotherapy, as well as the period leading up to it. All the spare energy I had went on exercise, be it walking to the hospital, cycling along the canal or yoga. 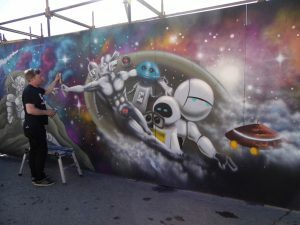 An artist day painting on the island of Millport set me on the road to creative recovery. Since then my sketchbook has filled up with bright pastels as I fell in love with Hebridean seascapes. Each beach more beautiful than the last. Another great Yardworks! 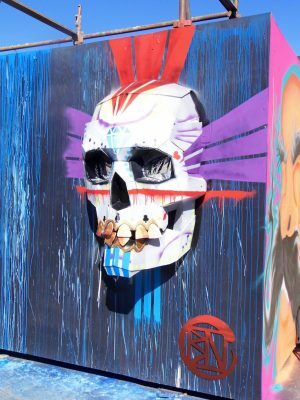 Before this year’s event I published a post about 2017’s, in anticipation of it being just as good. And it was! Always hard to choose favourites, but here are a few. Including the fox at the top of this post, which I loved for showing how modern life affects wildlife. 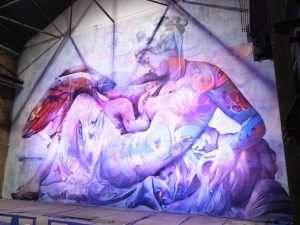 Naturally I went around snapping, and as a result do not know half of the artists. So apologies if you can see your work and feel free to let me know so I can edit and credit. 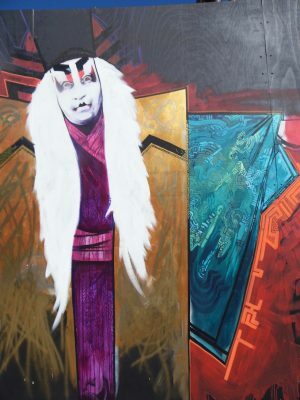 I did see our pal Marcus, of course, whose Japanese kabuki performer you see above. 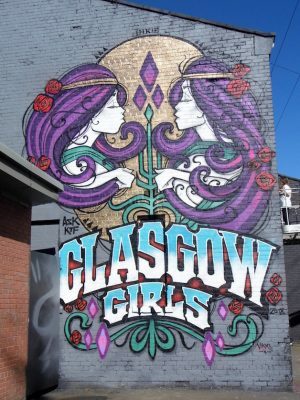 And I loved the Glasgow Girls piece, artist Linzi paying homage to the city’s Art Nouveau legacy. Cheating a bit here as this is April, when I took the train to Edinburgh to meet pals Olwen and Jonathan. The plan was to head off to North Berwick for a day’s sketching. But the Scottish spring being what it is, threats of snow loomed large. Fab independent shops galore! 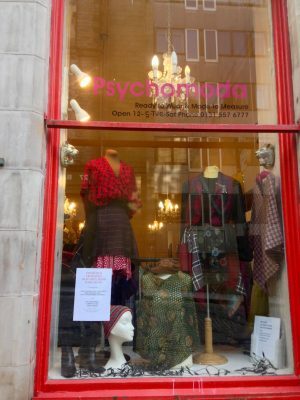 First of all we popped in to see old pal Alison, whose Psychomoda boutique is on St. Mary’s Street near the Royal Mile. Alison shared a flat with a friend when they were at Edinburgh College of Art. I remember her being up with the lark to work on her fashion course assignments. So it’s no wonder her business flourished. Cheating another wee bit because the green dress photo is from a couple of years back. Everything in the store is Alison’s own creation, including the handmade soap. 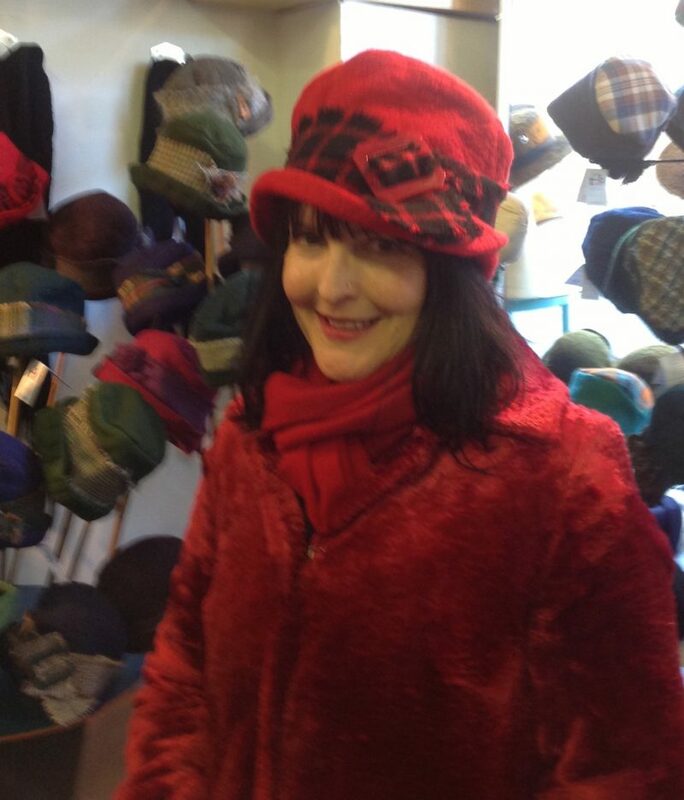 Next up was Armstrong’s, a huge vintage and second-hand store in the Grassmarket. It’s full to the gunnels! I wish I had a photo of myself in the leopard print coat with fake-fur collar I bought here in the 90s. In fact, I wish I still had the coat! Alas, I gifted it to a friend’s daughter. Along with a fab pair of red Miu Miu shoes I can no longer hobble in. 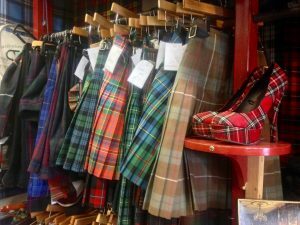 Speaking of shoes, how great are that tartan pair above? My own clan too. 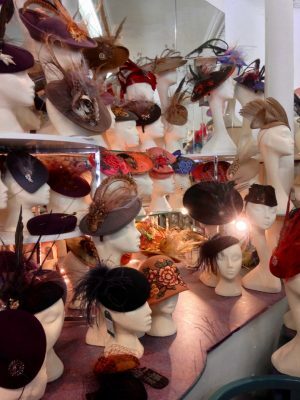 In yesterday’s post we bought hats from the fabulous Fabhatrix in the Grassmarket. Here’s one from a few years back around the same time of year. 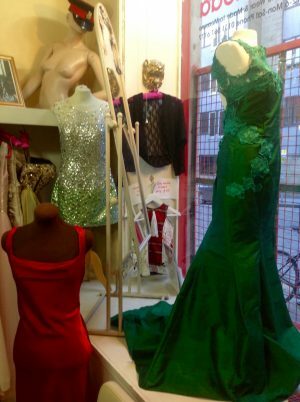 This photo earned a post on their Facebook page where I was described as one of their “glamorous customers”. All dressed up for a snowy Scottish spring! That’s all for the merry month of May 2018, folks (and a little bit of April). How was yours? 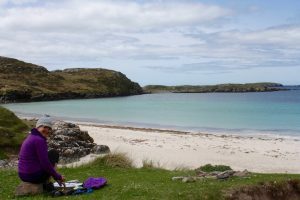 "Radiotherapy : 5 things that have helped my recovery"
"6 Reasons why Artists should visit the Outer Hebrides"